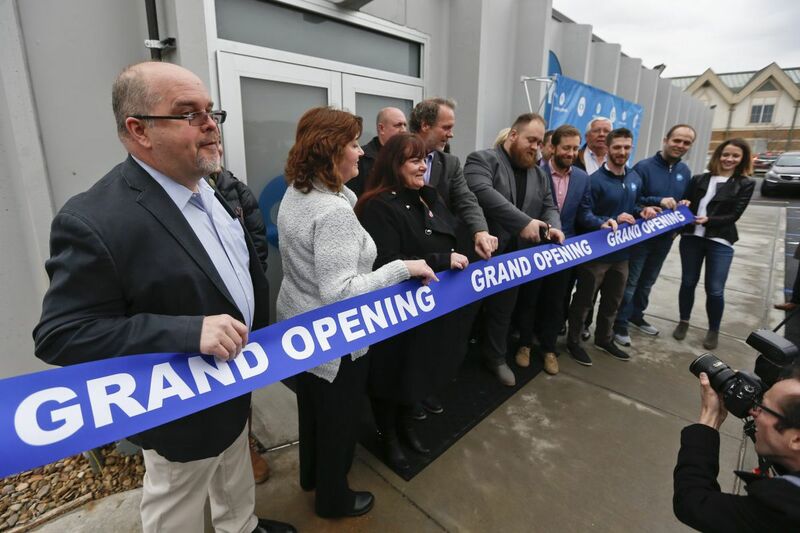 The mayor of Butler, Pa., Ben Smith (center) cuts the ribbon with a group of officials during an open house and media availability for the opening for CY+ Medical marijuana Dispensary last week. States with medical marijuana dispensaries saw "a significant decline" in opioid deaths over a 10-year period, according to a report published this week by the Journal of Health Economics. "The evidence suggests that Pennsylvania will see a reduction in opioid dependence and a reduction in overdose deaths" following the opening of the dispensaries, said David Powell, an economist for the Rand Corp., in an interview with the Inquirer and Daily News. The first dispensaries in Pennsylvania are to open next week, with the first medical marijuana products expected to be available to registered patients on Feb. 15. Powell coauthored the report, "Do medical marijuana laws reduce addictions and deaths related to pain killers," along with researchers from the University of California-Irvine, and the National Bureau of Economic Research in Cambridge, Mass. The study suggests that patients will substitute medical marijuana for addictive prescription opioids if cannabis products are available through dispensaries. Between 2000 and 2010, opioid-related fatalities and reductions in treatment admissions in states with flourishing dispensaries declined by about 20 percent. The report provides "some modest hope in an otherwise bleak landscape," Powell said. But he issued a caveat. The study was conducted in 2015, before fentanyl and other synthetic opioids began to ravage the nation, he said, so it may not be directly applicable to the current crisis. Illicit fentanyl, nearly all of it imported from China, has become the dominant killer implicated in fatal overdoses during the past two years. In addition, the association between medical marijuana dispensaries and fewer deaths appears to have weakened sharply after 2010, when states began to tighten requirements on sales by dispensaries. Powell said the declines were "relative." States that passed laws to legalize medical marijuana but don't have dispensaries did not experience declines. The state Department of Health, which administers Pennsylvania's medical marijuana program, has not had a chance to review the Rand report, said April Hutcheson, spokeswoman for the department. She said the state was reconsidering prescription guidelines for opioids used to treat non-cancer pain. "Medical marijuana is one of the things we're taking a look at for treating that type of chronic pain," Hutcheson said. Legal medical cannabis products are expected to be available for the first time ever in Pennsylvania next week at a handful of dispensaries. Keystone Canna Remedies in Bethlehem is scheduled to open Feb. 15. Keystone Shops in Devon is to open Feb. 16. Storefronts in Abington, Bristol, Devon, Elkins Park, Philadelphia, and Sellersville are expected to open by mid-March. Jason Mitchell, general manager of Keystone Shops, said he was excited to be playing a role in the battle against addiction. "I hope to see the same trend in a decline in deaths locally," Mitchell said. "I believe medical marijuana can be an exit strategy for people to get off opioids and live a healthier life."